Africa, in particular Nigeria, is dominating international mobile phone access to the BBC's website. According to July's statistics, 61% of the BBC's international Wap users came from Nigeria and 19% from South Africa. "Wap is the one platform where African countries continue to appear in the top five in our statistics," said BBC developer Gareth Owen. Africa is the world's largest-growing mobile phone market with unreliable landlines encouraging the growth. 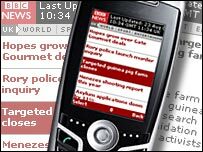 Wap technology - which stands for wireless application protocol - allows people to access basic information on the internet, like news summaries, through their mobile phone handset. Do you need a computer? According to the BBC's statistics, page views for Wap usage are growing at 100% year on year. UK users account for 65% of Wap traffic; and international usage for 35%. Mobile phone providers in many African countries have only recently begun rolling out Wap-enabled handsets. And the large take up of BBC news via mobiles in Nigeria contrasts starkly with the relatively small number of users accessing the internet via pcs - hampered by slow and unreliable landlines. The BBC's Technology correspondent Mark Ward says that in many places on the continent PC ownership is low but PC literacy surprisingly high. Internet cafes tend to be very popular, as much a meeting place as well as a place where people access their email, he says. The BBC receives regular messages of thanks from people in Africa, who say the only access they have to news is via their mobiles. "I'm in Uganda and the only access I have 2 the outside world is this pinhole 2 info cause I don't have access to TV. Thanx," said one texter from Uganda. The country accounted for 7% of BBC Wap usage in July. Other top countries helping account for the 58m Wap page views in July were Jamaica, Singapore and Israel. In the UK, the BBC has about a 20% share of the market with a reach of 1.2m users monthly.